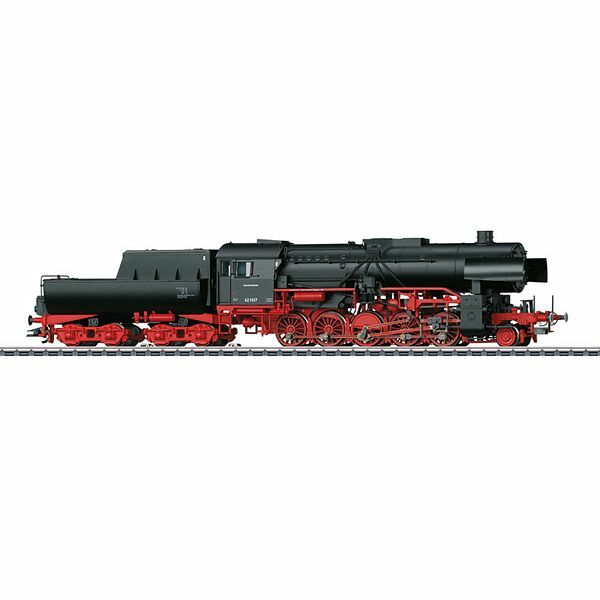 Four-axle Erz Id hopper cars for the transport of iron ore to go with this locomotive can be found under item number 00722 as a display of 24 pieces with different car numbers in the Marklin H0 assortment. Another 12 cars with different car numbers can be found in the Trix H0 assortment under item number 24120, with the specification for the required AC wheel sets. T22227/Ma39042 und T22224/Ma39043 – DB Class 42 Heavy Steam Freight Locomotive In World War II there was already discussion in 1941 about a wartime steam locomotive with an 18 metric ton axle load, the boiler of the class 44, and the running gear of the class 50 for use on lines in the Eastern March (Austria) and the occupied areas in Russia. 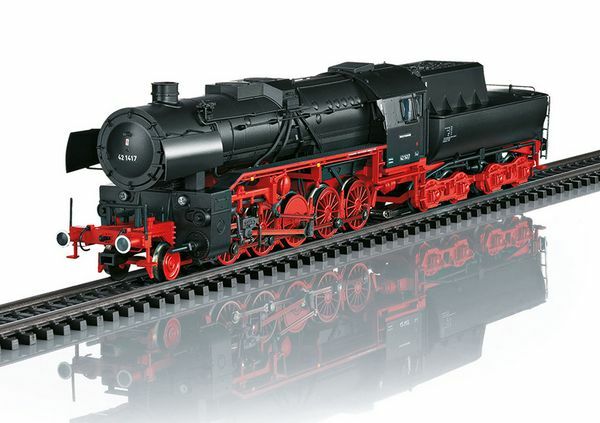 Two projects were finally favored from the 20 project suggestions for this so-called "Third Wartime Steam Locomotive" (KDL 3). After that, 8,000 units (a little later reduced to 5,000) were to be built of the class 42. Finally, the "Design" steering committee determined the following quantities: 2,500 locomotives with a stay bolt boiler and a bar frame, 1,150 locomotives with a Brotan boiler and a sheet metal frame, and 650 locomotives with a Brotan boiler and a condensation tender. Henschel delivered the first two units in 1943 with a Brotan boiler and the road numbers 42 0001 and 42 0002. 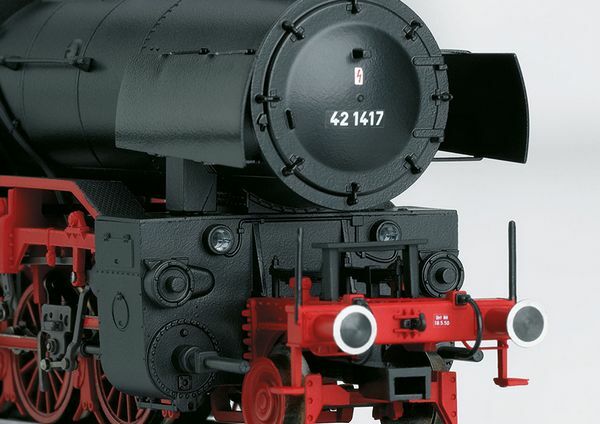 Schwartzkopff built the first locomotive with a stay bolt boiler in 1944 as road number 42 501. The class 42 units were a completely new design compared to the predecessor class 52 wartime locomotives derived from the class 50. Externally they had the simple construction of the wartime locomotives with an enclosed cab and only one side window, simple Degenkolb smoke deflectors, and solid wheels on the pilot truck. Yet they offered a striking appearance with the lanterns built into the cylinder block and the short running boards falling to the cylinders. The dome arrangement and the dome sheathing was also unusual. The originally planned quantities were not achieved because of the war. The industry delivered all total 865 of these 80 km/h / 50 mph fast and approximately 1,800 horsepower units. Subsequent production after World War II in Poland and Vienna-Floridsdorf increased the quantity in the end to 1,063 units. In the western zones, there were still 701 locomotives left, many of them not operational however. The DB distanced itself rather quickly from them. The last was put into storage on March 27, 1956. Yet with the incorporation of Saarland in 1957, class 42 units came back to the DB roster. Up until October of 1962, they were used mostly in the greater Saarbrucken area to pull ore trains and in heavy pusher service. In the neighboring country of Luxembourg road number 5519 (planned as 42 2718, built in 1948 in Vienna-Floridsdorf) is still in existence as the last operational unit of this class and it is used for special runs under steam.